I watch small children for a living. All boys. So when I saw the “mischief” prompt, I immediately thought of them running off to a room and closing a door. Because, you know, that usually indicates mischief is going on behind there. The chaos around the door is supposed to be coming from behind it. The last of the Mother’s Day gifts are the ones I literally finished on Mother’s Day. I started on Thursday, but I didn’t get much past laying down the grids until Sunday morning. Cool things are coming…I hope. I created the originals on half-sheets of cardstock with a Sharpie pen and a Faber Castel brush pen for thicker lines and the darkened parts. Then I scanned them, cleaned them up, and printed them again on cardstock. I also wrapped a piece of regular paper around them and taped it to create an envelope. I originally intended to make five, but waiting until the last minute left me with only the time to make three. I’m working on being more prepared for these types of things, but I’m not quite there yet. Obviously. Remember the birthday necklaces I made in January and posted last week? 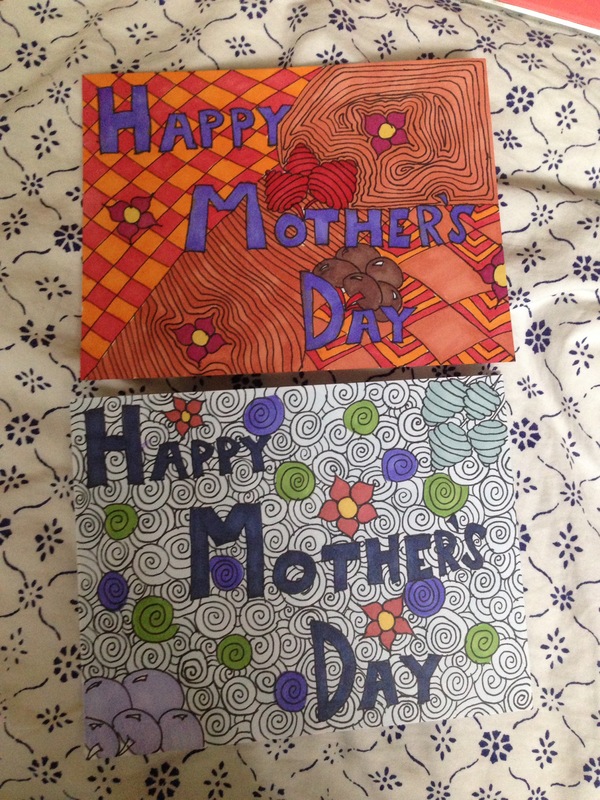 Well, I decided to make Mother’s Day gifts for my grandmothers that would go along with them. This time, I made bracelets. I used the same amethyst chips, some silver wire, and some silver chain. I made five beaded links and connected them together with chains. I once again used a magnetic clasp, because it is one of my new favorite materials to use in jewelry. I also made some Zentangle cards to send with them. I drew the patterns with a Sharpie pen, and then colored them with Prismacolor markers.